A nurse who murdered four elderly hospital patients has been ordered to serve at least 30 years in prison. 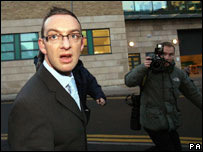 Colin Norris, 32, from Egilsay Terrace, Glasgow, denied killing the women with insulin at two Leeds hospitals in 2002. He was convicted on Monday at Newcastle Crown Court and was also found guilty of attempting to murder another woman. Jailing him for life, Mr Justice Griffith Williams said: "You are, I have absolutely no doubt, a thoroughly evil and dangerous man." 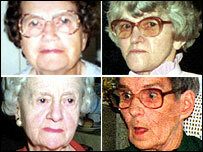 Detectives said he showed no remorse for killing Doris Ludlam, 80, Bridget Bourke, 88, Irene Crookes, 79, and Ethel Hall, 86, while he worked at the Leeds General Infirmary and the city's St James's Hospital. He also tried to kill Vera Wilby, 90, but she survived the coma which followed the unnecessary insulin injection. Norris was given four life sentences with a minimum term of 30 years for each of the murders and a 20-year sentence to run concurrently for attempted murder. The judge told him: "You are an arrogant and manipulative man with a real dislike of elderly patients. "The most telling evidence was that observation of one of your female patients, Bridget Tarpey, who said, 'He didn't like us old women'." The judge said Norris disliked the elderly because they needed too much care and he formed the belief that Norris was "essentially lazy". Can a killer nurse be foiled? "Only you know why that dislike was so much that you decided to kill. "Despite months of evidence, I am no wiser as to your motive." Police began an investigation after Dr Emma Ward noticed in November 2002 that Mrs Hall had slipped into a hypoglycaemic coma despite not being a diabetic. Blood tests showed she had insulin levels 12 times the norm. She died three weeks later. Detectives looked at other deaths on the wards when Norris was working and found evidence that by the time Dr Ward raised her concerns, he had already killed three times and failed with one attempt. Det Ch Supt Chris Gregg, of West Yorkshire Police, described Norris as "extremely arrogant". He said Norris had been growing in confidence and only the vigilance of Dr Ward prevented his six-month murder spree from continuing. The judge said he was certain that Norris was not carrying out mercy killings. "There cannot be any suggestion you were motivated to hasten their ends to spare them suffering; indeed, there was no evidence that any of them was suffering apart from the pains that the elderly sometimes have," he said..
"I suspect you enjoyed the power that ending a life gave you, choosing the elderly because they were defenceless."